Wasabi is a popular ingredient in Japanese cuisine. It's not only good for adding a zesty kick to your sushi or sashimi; in fact, there are many wasabi health benefits. 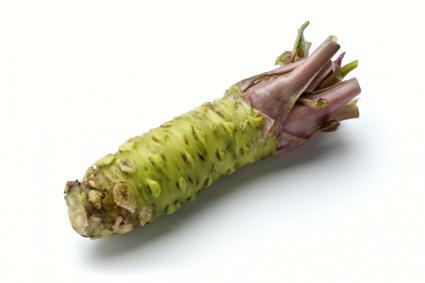 Wasabi is a pungent and spicy root vegetable sometimes called "Japanese horseradish." It's a member of the Brassicaceae family of cruciferous vegetables which also includes cabbage, broccoli, horseradish and mustard. Wasabi root is usually ground into a green paste and served as a condiment. Unfortunately, much of the so-called wasabi served in U.S. restaurants isn't made from fresh wasabi at all but is a combination of horseradish, and/or mustard and green food coloring. This is because fresh wasabi root is very hard to grow, rarely found in the U.S., and extremely expensive. If you're lucky, you may find fresh wasabi at a Japanese specialty market or import store and some U.S. growers will ship fresh wasabi to you. But wasabi powder, which can be combined with water and made into a paste, or pre-made wasabi paste is a bit easier to find. Although all parts of a wasabi plant are edible, it's the rhizome that holds the magic. The rhizome is the green colored, root-like stem, ranging from three to six inches long, found above the ground. If you want to harness the health benefits of wasabi, look for the real deal. If you can't find fresh wasabi, be sure to read the labels of any wasabi product you buy to make sure it contains real wasabi (Wasabia japonica) and not horseradish. Both fresh and powdered wasabi offer health benefits. But again, not all powdered wasabi is created equal. Some versions contain other parts of the wasabi plant such as leaves and stalks. Look for powder that contains 100 percent Wasabia japonica rhizomes. Wasabi contains isothiocyanates which, according to the Linus Pauling Institute (LPI), come from the breakdown of glucosinolates. Glucosinolates are sulfur compounds found in cruciferous vegetables. Isothiocyanates are responsible for most of wasabi's impressive health benefits. According to LPI, isothiocyanates have been found to discourage the development of some chemically-induced cancers in animals including lung, liver, esophagus, stomach, small intestine, colon and breast cancers. Additional studies on humans suggest eating cruciferous vegetables may decrease cancer risk. However, LPI cautions that it's unclear at this point if the decreased risk is due solely from isothiocyanate content or other benefits of eating cruciferous vegetables. According to a PubMed abstract, the effect of a specific isothiocyanate (6-MITC) obtained from Wasabia japonica on human pancreatic cancer cells was evaluated. The study concluded that 6-MITC may help inhibit the growth of certain pancreatic cells. A separate study also supports wasabi's anti-inflammatory and anti-coagulant properties. The study looked specifically at human umbilical endothelial cells (cells which line the interior surface of blood vessels) and concluded that 6-MITC has therapeutic potential to treat vasculitis and vascular inflammation. A study published in the International Journal of Food Biology determined that Japanese and Korean wasabi has anti-microbial effects against Helicobacter pylori bacteria. In this study, the leaves of the wasabi plant showed the most anti-microbial potential. Wasabi isothiocyanates "have an inhibitory effect on several strains of bacteria, yeast and mold," states an article by Glen Nagel, ND and Brian Oates PhD on the Naturopathic Doctor News and Review's (NDNR) website. The article mentions studies that show 6-MITC to be effective against Staphylococcus aureus and Escherichia coli bacteria, both of which cause serious and sometimes life-threatening illness. In addition, isothiocyanates are also shown to be effective against Streptococcus mutans, a bacteria that causes the majority of dental cavities. In addition, the article mentions that a compound found in wasabi leaf stalk extract stimulates bone calcification. This exciting find may lead to future treatments for osteoporosis. Wasabi is a potent vegetable with impressive healing potential. Continued research on its natural compounds may lead to new treatments for many common and serious illnesses. With studies varying in their methods -such as some using quality wasabi while others use powder- it's important to consult with your doctor before using wasabi to treat or prevent any illness. So go ahead and add another dab of wasabi to your sushi - just make sure it's the real thing.